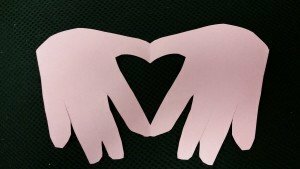 This cute Valentine’s Day project is fun and easy to make. It’s cute all by itself or can be used as a card. This project is also great to do for a mother’s day or father’s day card. Follow the step-by-step directions below to make your very own heart in my hands project. Step 1: Fold the construction paper in half like a card. 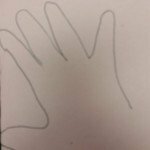 Trace your child’s hand onto the paper. Make sure their hand is slightly slanted so that the tip of their thumb and pointer finger is touching the fold. Step 2: Cut out your child’s hand. Cut in a circular motion where the bottom of their hand would be. Make sure you do not cut where the tip pf their thumb and pointer finger touches the fold. This will hold the card together and make the heart shape. Step 3: Open the folded paper to revel the heart in the hand, decorate as you wish.